OOPS! 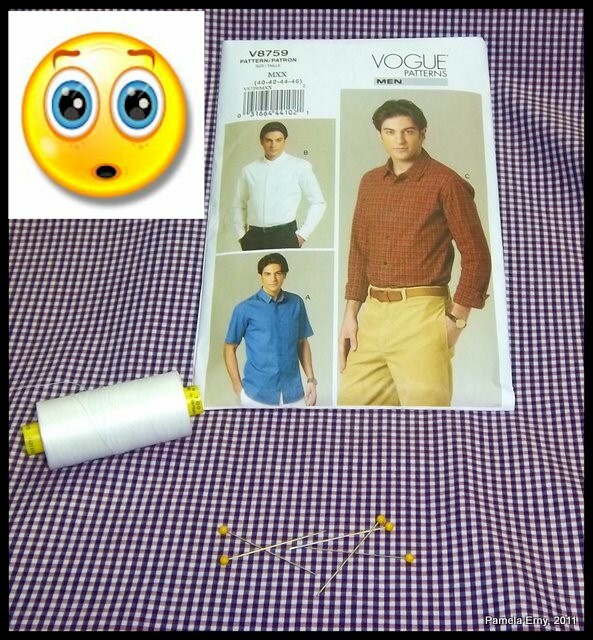 I totally misread Vogue 8759 pattern's online photos and diagrams! You may now give me 10 lashes with a wet noodle...be gentle. And I should know better...that's why I started drafting my own shirt patterns in the first place...sigh. Once I had a chance to really examine this pattern up close and personal...well...there were some design details I was not expecting. Not they are necessarily BAD details...just different than the way most mens shirts are drafted. I compared V8759 to my own hand-drafted "slim-cut" shirt pattern with a shoulder-sleeve seam line that stops just a tiny bit below the arm/shoulder joint. This Vogue pattern has a longer shoulder seam..in other words, the sleeve will be more dropped than I prefer. Then there is the yoke. At first glance in the online pattern catalog, it seemed to be fine..though I did notice that the front "yoke-drop" seemed a bit shallow...and that can be OK. However, until I looked at the pattern closely and measured it.... I didn't realize that the yoke seam only drops a very scant 1/4" down into the front. 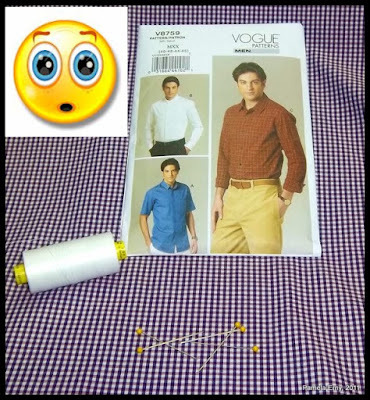 In other words, like a ladies blouse, the shoulder-yoke seam on this men's shirt pattern will virtually ride right along the exact shoulder line, instead of dropping/sinking down into the front the way most mens shirts do. Additionally, the overall width of the shirt body is larger than my hand-drafted "slim-cut" shirt, and also larger than other printed patterns in my stash. I do realize that these are the decisions that the Vogue pattern designer made, and I respect that. But it is a look that I do not prefer. The Vogue 8759 sleeves seem fine...narrow enough, and the armscye is as high as my own "slim-cut" draft. They are 2-piece, and the sleeve plackets are reminiscent of the way casual sport coat/blazer vents are drafted. So...am I going to take the time and fabric to sew up a test garment of a pattern with style lines I do not like? Sure, I could re-draft the parts I do not like....but I already have slimmer-cut men's shirt patterns that I have drafted by hand...why take the time to change this one? Should you use this pattern? So while this pattern is not "horrible"...I am not happy with it, so I am not going to use my time to make it. And please remember...this is just my opinion, for what it's worth. Your opinion about these things are probably quite different than mine...as they should be...because we all have different tastes. Thanks for your opinion on the pattern! We all have different experiences that we bring to the sewing table and they should be respected. Everyone has their preferences. Good thing you made the comparisons before you put any work into the shirt! Interesting! Thanks for the heads up. Thank you for this info! Have you ever thought of selling your patterns? I would be very interested, as my hubby would love a nice shirt! Well, it looks like I will continue to use the Colette patterns Negroni shirt. I agree with you on the yoke seam riding right on the shoulder. I don't even like them for myself. And like Linda, above, I don't care to deal with the two piece sleeve. I would end up redrawing it into a one piece and adding a standard men's sleeve placket. So thanks for the review. Thanks for posting this review - very helpful. This is exactly the type of information I like to get. Thanks for the heads-up. So much for my considering making this up for DH. This review is very helpful--thank you! I was going to try this but am rethinking it. My husband likes very slim cut shirts that almost hug his body. He buys them when he's abroad but can't find much here in Austin, where looser or camp-style shirts are more in fashion. I haven't been able to find a good slim-fit pattern from which to start--do you have any recommendations from others you have tried? Very helpful! I second Amy's question - do you have any recommendations for a slim cut shirt pattern? Thanks! Good insights, Pam...Maybe you should make your own line of men's shirt patterns! Have a lovely WNY day! Well done! The available time is too valuable to spend on something like beforehand .... thanks for sharing all this information, it's an objective viewpoint. Very interesting. I enjoyed reading your evaluation of this pattern! Thank you!